Final stop for Restaurant Week is Mamma Maria in the North End’s North Square. I read some good reviews and knew it was a little pricey which made it perfect for R.W.’s $33.11 deal. The dining room is small with about 9 tables. Floor to ceiling windows provide a view of the peaceful North Square. 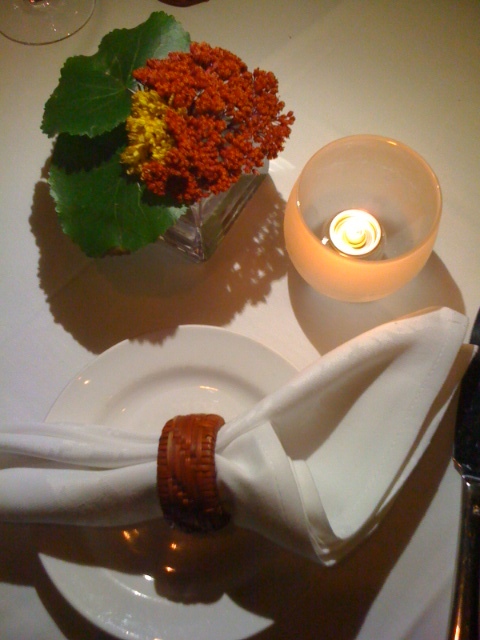 We were seated at a table of 4 and I immediately noticed the chair covers (suggests a fancier environment) and the napkin rings (a home-y accent piece). There seemed to be a mix of casual and formal decorations which made me feel alright about wearing jeans. 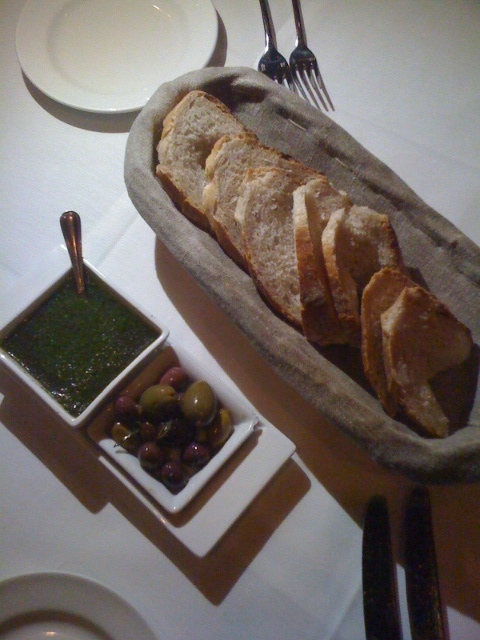 Bread: About 7 slices were served in a long basket with a side of pesto and olives. I love seeing a change of pace with bread accompaniments – I could put pesto on anything! Great start to the meal. Menu: Their entire menu was available to choose from, with *asterisks next to the dishes that were part of Restaurant Week. They hadn’t posted their R.W. menu on the web so I was quite anxious to see what they were offering, and I was pleasantly surprised! Jess & I couldn’t choose what antipasti we wanted to start with, so she ordered the Squash Pasta while I got the Salumi – we split them in half to share. 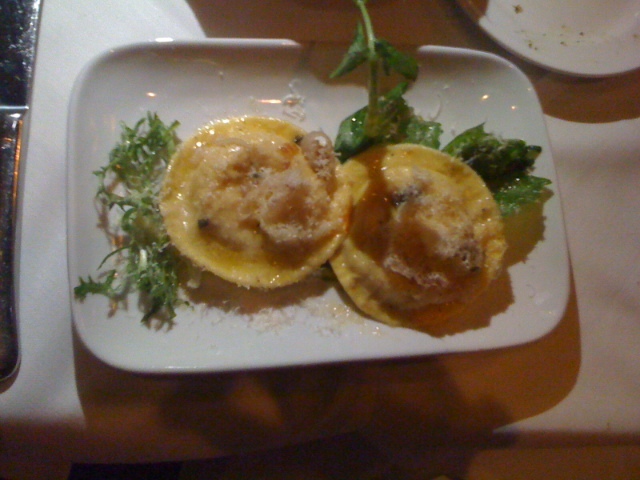 Two raviolis side by side were topped with grated cheese. Thank goodness this was an app because I’m not sure how many of these I could have eaten. 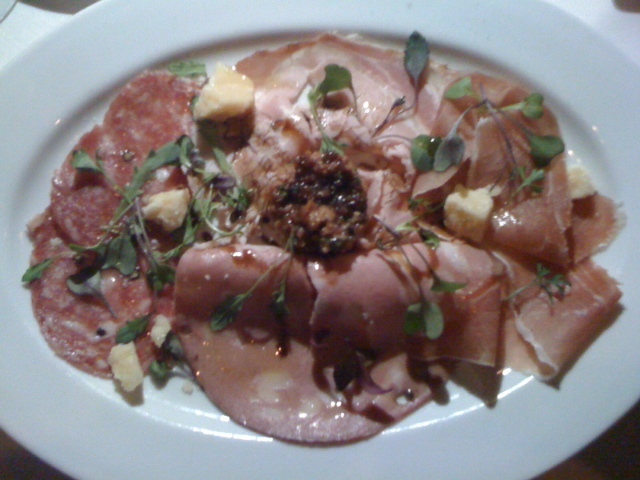 They were good but very full and rich, which made it perfect for a small first course. I really only ordered this because Jess was dying to taste it 🙂 My favorite of the meat was the salami as I found the others a bit too salty. Placed in the middle of the meats was the panzanella (which I had to Google and figured out it is “a salad of bread and tomatoes”). All in all not bad, but I couldn’t finish my 1/2 portion. All my dreams came true with this entrée. 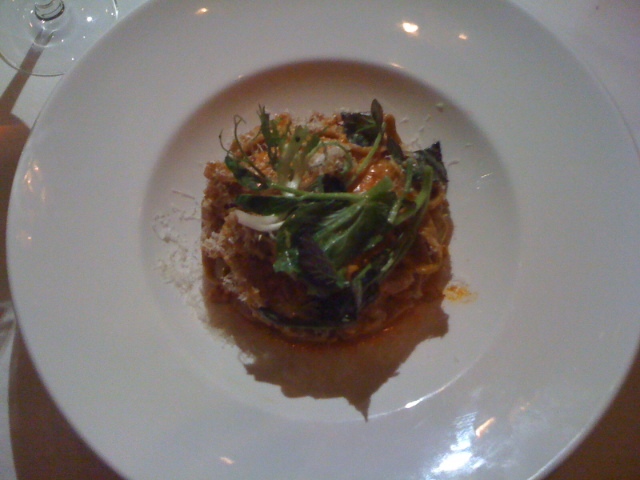 The taglierini was presented in a tight round mound topped with greens (and parmesan once they grated it over my pasta). I have never tasted a pasta cooked this al dente and I couldn’t have been more pleased. The taglierini had great consistency and the meat/sauce was nicely proportioned. I can’t wait to dig into those leftovers! 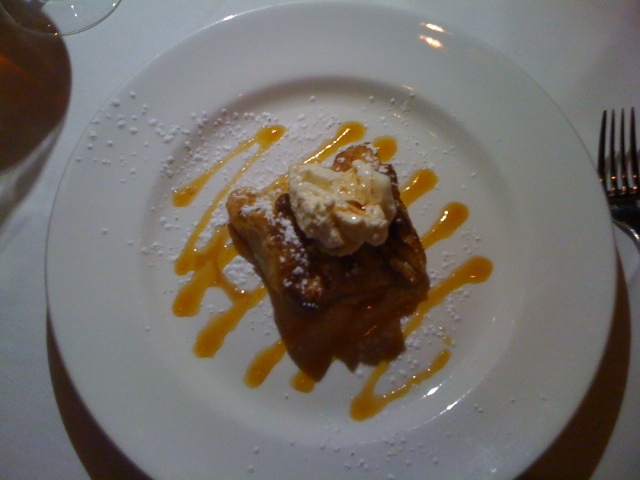 2 Restaurant Week meals in 2 nights with 2 Apple Tarts – but I’m not mad (I had the same dessert at Lumiere the night before)! Dough was flakey, whipped cream was heavy almost to the point of a softened ice cream, and the apple reduction made for a sweet and pretty sauce/decoration. Bathroom: A single room/stall unisex restroom. 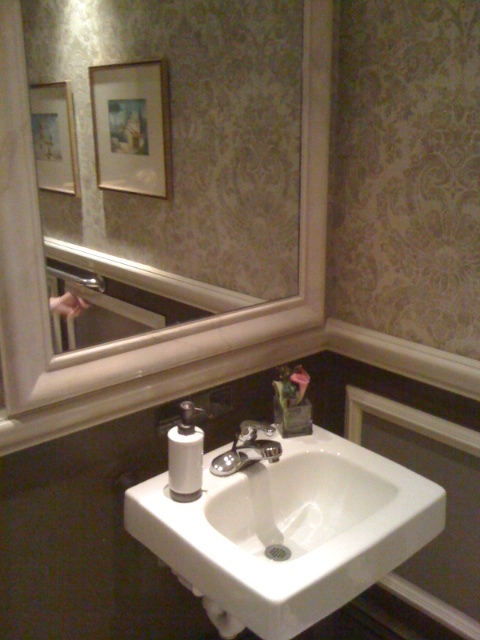 Similar to the dining room décor, the bathroom’s colors were muted and soothing, with decorative wall paper that made you feel as if you were in someone’s home. Wait Staff: Very kind and professional. At one point Ben’s cocktail slipped from his hand and landed on the table, somehow cracking in two clean pieces. Needless to say, the table and his pants were soaked and within 10 seconds our waiter and the manager came rushing over to help with the broken glass. They laid a few cloth napkins on the table in front of Ben and gave him extra to dry off with. We were well taken care of! 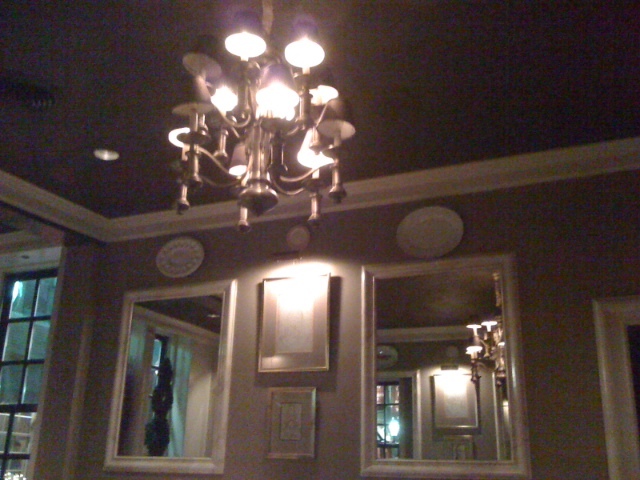 Overall: I get both a feeling of comfort and class from the dining room – large oversized mirrors hang on opposite walls, a chandelier dangles in the center of the room, the wall decorations could be something you’d find in your home. 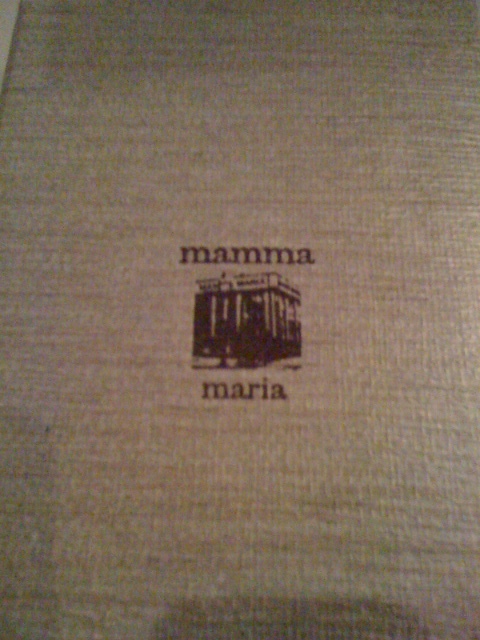 I really enjoyed my entrée and would love to try Mamma Maria again if the prices weren’t so high (entrees range from $26-$36, with some pasta options offered as small plates for almost ½ the price). They have 5 private dining areas upstairs and can accommodate up to 50 people. Perhaps a nice b-day dinner is in store…! The Perfect Bite: Taglierini Bolognese. This may have climbed its way to my Top 5 Bolognese Pastas in Boston! This entry was posted in North End by Dena Raffa. Bookmark the permalink.